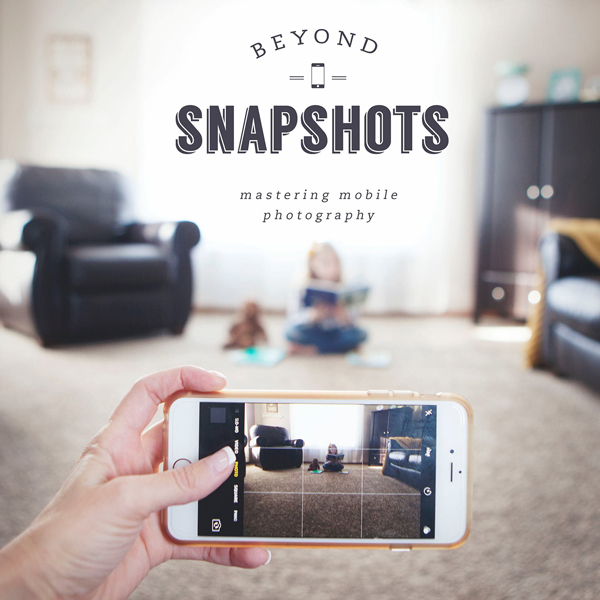 Join us for part 1 in this 12 month series, “One Year to More Organized Photos.” Taking photos is just the first step in preserving your precious family memories. 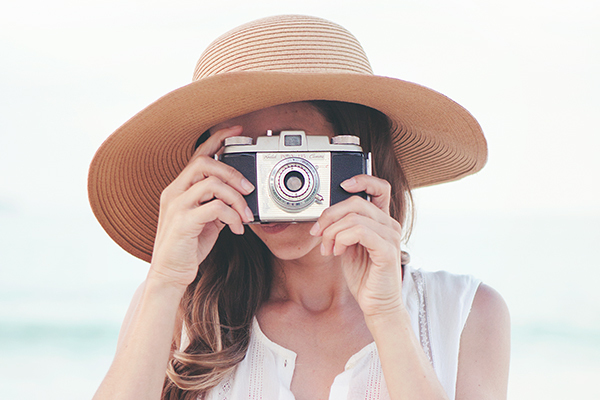 Making sure your treasured photos are safe and accessible is a legacy you’ll leave to your family – and today the journey to more organized photos begins! 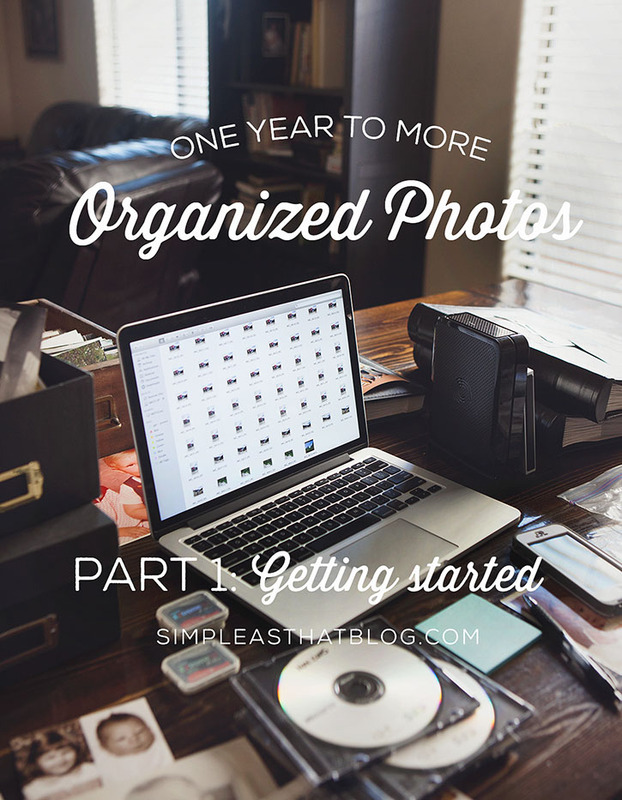 A few weeks ago I announced this brand new (and exciting) series: “One Year to More Organized Photos!” and I’m so excited to kick things off today! This is an area that so many of us struggle with – including myself – and I’ve decided that 2015 is the year to get a handle on all these photos! In this digital age, the sheer volume of photos we have to organize it astounding and when faced with such a daunting task, it can quickly get overwhelming. I haven’t known where to begin and so I’ve avoided the mess my images are in for too long! Over the past three weeks I’ve slowly begun the process of getting my photos in order. From printed images, to digital – I’m ready to get things in order and am thrilled to be on this journey to more organized photos with you! Does this scene look familiar to any of you? I’ve got photos in boxes, on CD’s, on hard drives, in baggies and photos on my phone. They’re everywhere! If you’ve let your photos go as long as I have, it’s going to be a process to get it all under control, but believe me, it’s possible and today is the day to start! Getting my photo clutter under control is going to be a big job and I think it’s important to be aware that such a huge undertaking isn’t going to get fixed in 1 day, 1 week or even 1 month. The key is breaking the process up into smaller , manageable tasks and enjoy the process! This isn’t going to happen all at once, it’s going to take time and I’m determined to take this next year to get my photos organized and develop a system that works for me to KEEP them organized! Today we’re going to start at the very beginning! The first step in organizing all those photos is finding them all! If you’re anything like me, you may have photos scattered around the house! Where could they possibly be? They could be on your computer, on hard drives, saved on discs, tossed in a box, stored online, in albums or on your phone. The first step in this whole process is to gather your photos together in one place to see what you’re dealing with. I literally brought all my photos together and piled them on the kitchen table to see what I’d gotten myself into! 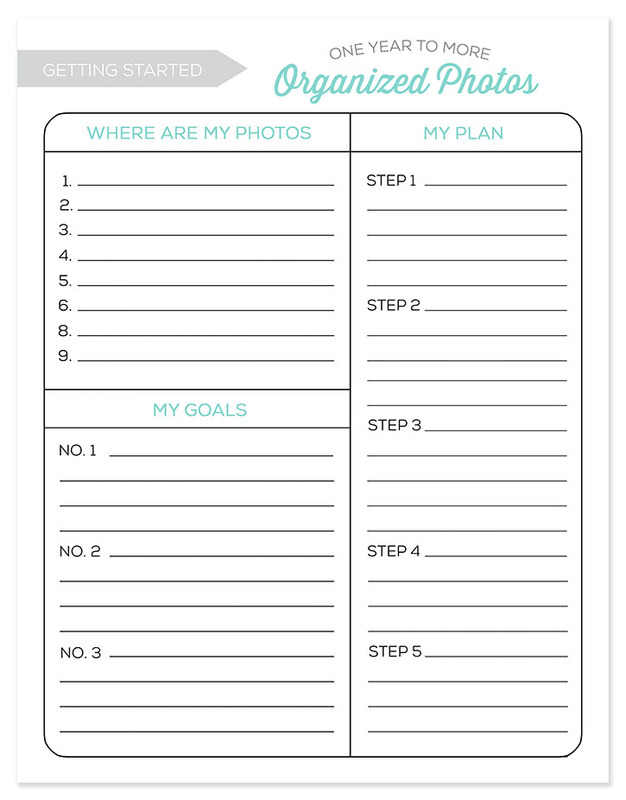 You could do the same or simply jot down a list of places where your photos are stored on this handy printable I designed to help you as you get started in this process. Once you’ve found all your images, have a look through them all and see how many there are stored in various locations. 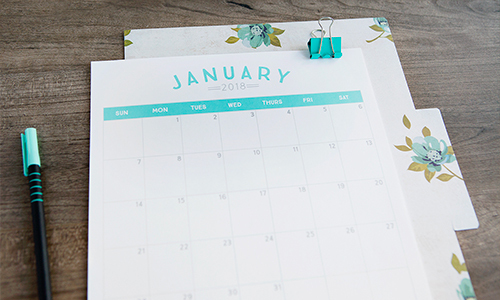 Jot down some notes on years/dates and where to find them and keep these notes handy so you can refer back to them when it comes time to start organizing. This step is all about evaluating – we’re not sorting yet, we’re simply taking stock of WHAT needs to be organized. Next, set some goals for yourself. Maybe you want to get your printed photos in albums. 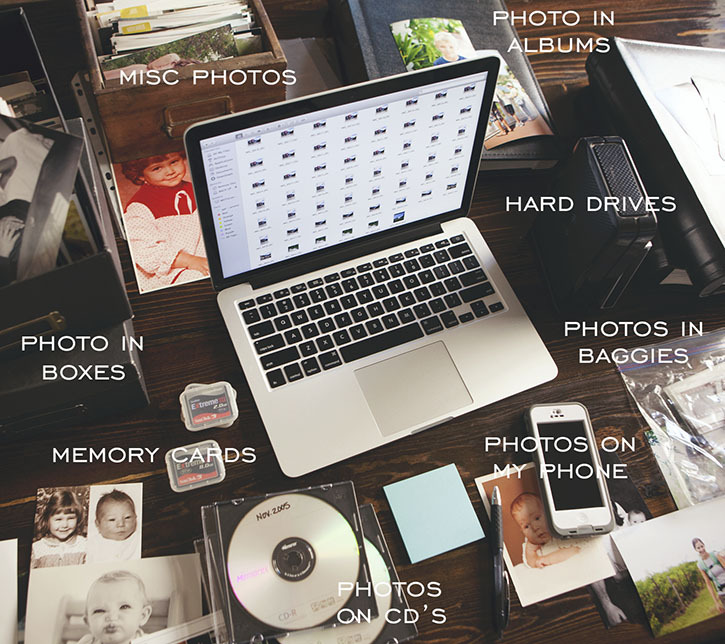 Maybe you’re eager to develop a system for organizing your digital images. Whatever your goals may be when it comes to photo organization, get them down on paper so you can start coming up with a plan of exactly how to make those goals a reality! 1. To get my photos printed and in albums. I have hodge podge of printed images in boxes and I hope to get those sorted and then start on printing images that I have stored on my computer/hard drives and get them in albums! 2. I want to downsize my collection of digital photos. As a photographer, I take a lot of photos and the reality is, I just can’t keep them all! I am eager to purge my collection and get rid of any saved duplicates I may have and unnecessary photo clutter and really minimize the number of images I’m storing. 1. 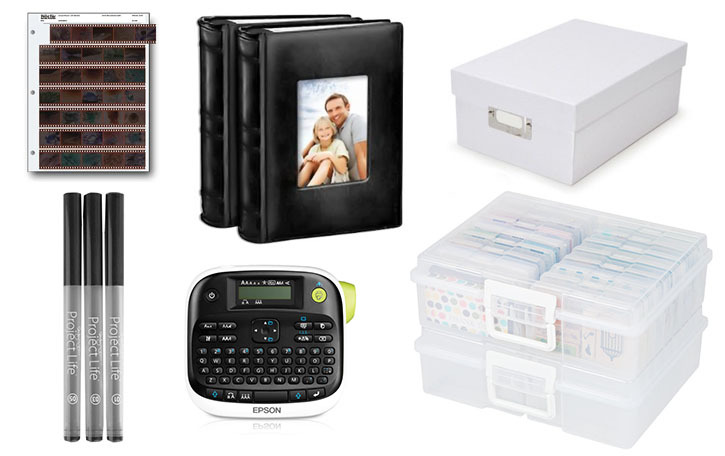 How much time do you have to devote to photo organization? An hour a day? A week? Set a realistic timeframe for yourself based on your personal schedule and go from there. 2. Where is the best place to work on this project? The best place for me is the kitchen table where I can spread everything out in front of me, but I can’t leave things out where little hands can touch and we do need to eat meals. What I’ve done is reserved a big plastic storage container as my “in progress” bin. This is where I can keep the majority of my photo junk and all the supplies I need to work with. When I have an hour here or there I can bring it to the table, set it out and work then put it all back in the bin when I need to clean up. 3. Keep things simple. I can’t stress this enough. When coming up with an organizational system that you can stick with the best ones are always the simplest. I’ll be sharing more in upcoming posts with specifics on HOW I’ll be organizing my images and what systems I have set in place – but always, always, keep it very basic and simple! This first step in the organizational process is a big one and will set the tone for the rest of this project so don’t get ahead of yourself – remember to take it slow and not expect results immediately. I can’t wait to see your progress! I’ll be sharing updates as I continue to work on my photos on Instagram, you can follow me here: rebecca_simpleasthat. I’d love to see how things are coming along for you as well! Snap a quick photo and tag your photos #OneYeartoOrganizedPhotos! This is going to be amazing! Just think of what we’re going to accomplish this year – this truly is just the beginning! In preparation for the next posts coming in the series as we dive deeper into the organizational process, here’s a quick list of supplies you may need. These certainly aren’t things you have to have to get your photos organized but they are products I know and trust and I will be using them throughout the series! 1. Archival safe Pens. When it comes to writing dates on photos and in albums you want to make sure you choose archival safe pens. I love using Project Life pens, I always keep a set or two of these in stock. Did you know that sharpies are archival safe and acid free as well? These fine point sharpies are great for writing on CD’s, jotting down dates in albums, etc. 2. Photo containers. I’ve been using these 4×6 plastic photo storage containers by IRIS for years and love them! Not only are they great for safely storing photos they’re also the perfect size for organizing crayons and other kids craft supplies! This is a large size photo keeper by IRIS and it comes in a set of two so you get 32 of the 4×6 containers. FYI these 4×6 containers fit perfectly in the IKEA Raskog Utility Cart, they’re such great size for photos, project life cards and more! I can’t say enough good things about these little containers! 3. Photo albums. Albums can be expensive and after shopping around I purchased a large number of black faux leather albums from Costco (see image above) to house my printed photos. I love the look of them, they fit a lot of photos (300+) and the price was great – $19.99 for a set of two. 4. Photo boxes. These are another great option for photo storage. Photo boxes can be purchased inexpensively at your local craft store. I will mention that I’ve had my boxes for a number of year and while they’ve been great, they haven’t held up through a number of moves and lots of use. Most of the lids are now damaged and I’m looking to invest in more of the plastic IRIS containers as soon as I can. 5. Negative Sleeves. If you have a lot of photos from the pre-digital age you may also have a number of negatives that need storing. I purchased a set of negative sleeves a few years ago and have yet to get my negatives in them – but that’s something I plan to do over the course of the year. These sleeves are a great, safe way to store your negatives. 6. Label maker. When it comes to organizing my photos I plan to organize by year and date and will be labeling my containers, etc. using my handy label maker. I have this Epson Labelworks model and it’s been great! Have questions or ideas related to what I’ve shared today? I’d love to hear your thoughts in the comments below! There are so many ways to go about organizing your photos and it’s always great to hear how other people are tackling the challenge! i am so excited for these series. one of my goals for 2015 is to get my pictures organized and establish a system. thank you for sharing your ideas, tips, and tricks. i am thrilled to hear them and to get started. Thank you for taking the time to put this together! So much work and it’s going to be so helpful! I am so excited for this series! Thank you so much for sharing your plan and your progress with us. I am curious if you plan to do any tagging/rating/sorting of your digital photos. This is one area that creates an enormous backlog for me. I’m looking forward to getting Photo Organized by years end!! Thanks for responding Rebecca! Right now I use Photoshop to sort, rate and tag my photos. It works well, but I would prefer to have something that I can use on my iPad or iPhone. I take 95% of my photos on my phone and I don’t upload them until the beginning of the following month. I find if I upload randomly, I lose track of which photos I’ve uploaded and it becomes a much bigger process. Starting this month, I plan to upload and organize my photos from the previous month on or just after the first of every month. I tend to crop my photos as I take them (more or less) and it would be so handy if I could tag and rate them at the same time and have that metadata transfer with the photo to my computer. I’ve yet to find something that will allow me to do that so I’m very interested to learn what you discover in your research. Please keep me posted! Julie B., I have used “This Life” by Shutterfly for the last year to organize and tag my phone photos. I take so very many on my phone as well (I took a class by BigPictureClasses on phone photography and have been using my phone so much since then), This Life costs between $100-$150 a year and it automatically updates my photos from my phone very easily and then they are available on my computer as well. I just pull up https://app.thislife.com/library and all of my photos from my phone are there on my computer. It gathers all photos from your devices. If I remember the space available for the plan I bought was 400,000 photos or 400GB. It’s wonderful. So, from my phone for example, a photo is uploaded and I can tag people, add other tags, add location and a caption. This is just one option, but I love it. To check it out, go to http://www.shutterfly.com and at the top of the page click on “this life”. Good luck with your photo organizing! Thank you for organizing this series. Do you know how often there will be a post for the series? Is it once a month? I just want to know how long I have for this step. Thank you!!! Thank you so much! I started following your instagram account today too!!! SO excited about this, friend! XOXO! Hello. I have been looking forward to this series! I would love your feedback on my question. I have 2 IRIS boxes that hold the hundreds of 4×6 pictures and my questions is do I hold onto them. My reasoning for possibly getting rid of them is that I have a massive collection of scrapbooks and project life albums that include these photos. Most of the photos I have hard copies have been documented in some way. So, is it worth it to keep them? Thank you! I appreciate the feedback. Thank you so much for this series!! I recently had my second daughter and I am so overwhelmed with all the photos I have. Digital photography is great, but we take so many images. I have never been able to develop a good system, so I am excited to see what you discover as you work through and research this process. I am also very interested in the IRIS boxes for storage. They look fantastic for both my photos and project life cards. Thanks again! In the interest of efficiency, are you resisting the urge to edit your photos before printing? Do you have a plan regarding when to edit and when not to? Rebecca, I just wanted to say thank you for taking the initiative to get all of us more organized! I’m looking forward to this journey! All the best! Are you planning to just put photos into regular albums or will you also be scrapbooking them?? I find this a challenge as it feels overwhelming to think about scrapbooking so many photos!! The albums you purchased at Costo look very nice. Anxious to hear how you will be using them. I am really looking forward to your new series. I have a question regarding albums. Are you not planning to scrapbook in Project Life Albums any more since you mentioned that you purchased the albums above from Costco? I have a rediculously complicated process for my digital photo workflow and would love to find something simpler! I really like some sort of date/name printed on the back of my photos (which is a service Shutterfly offers) so I take the time to first pull my pictures onto a Windows computer (I use an iMac, but I am also running Windows on it specifically because of wanting the date stamped on the back of my photos) so I can rename groups of photos all at once such as “2010 jan-march”. From my experience, I haven’t found a way to do this on a Mac. I have found that while iPhoto will let me rename groups of photos, it doesn’t really change the info attached to the photo, so when I print the photo, the original name of “img0001” is what gets stamped on the back. Once my photos are renamed, I use Photoshop Elements to sort and tag my favorite photos (both chronologically and by other tags such as “cousins”, “our home”, etc.). Then, I upload the chronologically tagged favorite photos to identically named folders in Shutterfly and have them printed. It’s really great to get my final result with the name of the photos, which in my case would be a date stamp like “2010 jan-march” on the back of each group of photos. I then copy them onto identical folders on the Mac side of my computer for easier access. So I’m doing double the work, and storing doubles of the photos on my hard drive! I really love my final result, I just wish there was an easier way to get there. As far as pictures from my phone, I know Shutterfly has an app that you can upload photos to (directly from your phone), but then none of them would be tagged and organized in PSE first. So I’m still looking for a solution for that as well. Hi Rachel! Wow, that’s a lot of work! I do about half of what you do (put my photos in monthly files on my hard drive, pull them into Photoshop to rate and tag them with specialized tags like the ones you use, upload the photos to Shutterfly using monthly folders) but I don’t have to toggle back and forth between a Mac and a PC. I’m surprised to learn that there isn’t a way in Shutterfly to make the date stamp a printing default. I may have misunderstood your work flow, but it sounds like if you could get Shutterfly to do that job for you automatically, you could skip the step of pulling your photos into Windows. I’m going to check into that one…. Thanks Rachel! I’ll check it out…. Yes, you’re right. Shutterfly can stamp a whole group of photos with the same info (such as a date) on the back pretty easily. You can either have all of the photos have the same name (date), or you can add text in front of the existing name of the photo. It’s a really great feature! I use these options as well for the photos that were never named before I started my system. I thought of just renaming the group before uploading to Shutterfly, but once Photoshop has found them in a specific location, by a specific name, it will be confused and not know where the photos are if you have renamed them in Windows after already pulling into the PSE Organizer. Does that make sense? Oh and as far as just skipping the step of first naming in Windows, instead of just re-naming in Shutterfly, I just like the actual photo dated and sometimes named (i.e. “2010 oct-dec_Homecoming”) as well on my computer. I know it’s a crazy system! 🙂 I just wish there were an easy way to rename groups of photos on a Mac. It seems like an easy enough thing. I’ll keep wishing! Oh and as far as the Shutterfly app, I love that at any time, I can easily view my photos in the folders I created on there, and even share or order prints from there! I found your blog through Pinterest and am really looking forward to this series! I have a system that works mostly OK, but being an organization junkie I feel it can still be greatly improved. Working along side others doing the same project should work well for me to keep me on task! I am really looking forward to this series! In 2014 I was really good about backing up each month (thanks to your inspiration), but I have never renamed any of my pictures. Thanks to multiple cameras and lots of pictures I now have many pictures with the same name. My goals for 2015 are to find and keep a renaming system going forward and hopefully have time to go back and apply it to the many previous years. Also, I have many pre-digital pictures as most of us do. Will you be talking about options to scan in negatives or photos to digitize older pictures? Thank you for this series!! I’m hopeful that this will be my year with some motivation and ideas from you:) Also sending this to my mom who has the same problems! Like mother, like daughter, I guess!! Do you have a link for the albums from Costco (can’t find them on their site) or did you buy them in-store? I have used the creative memories system for 18 years. The had a digital storage vault method with sort box/folders. In the vault they are all organized by date stamp from the camera. Problem is they went bankrupt. They had a great system. I think they became historian. Now I am not exactly sure who they r. I would like to continue with their organizational system but would welcome other ideas. I look forward to thefuture posts u will have. Thank u! I’ve been attempting to organize my photos (which are on/in as many places and formats as yours) for years now – the task just keeps getting more complicated. I”m determined to follow along and get organized! I have more photos than most people, having photographed for newspapers. I hope to organize and at least at my funeral get them distributed. I wish that I would have albumized them by family, so they can easily be shared when I pass…..also By Christmas’s, Christmas card photos, each binder the same family….etc etc. Your blog will help so many people. We probably ALL have such a dilemma. I also for 10 years at my last house, kept most important photos in a curio cabinet by the front door, in the case of fire that would have been the first thing I grabbed if I had the chance (besides pets of course). Nowadays we can have everything backed up in three places and online. I have multiple plastic storage boxes (big ones, the kind you can slide under your bed) full of pictures that have been waiting patiently for years to see the light of day. I have attempted over the years, to find some way to display some of them without losing their “place” with the other pictures they came from as well as the negatives. I know, I’m probably a little over obsessive about that. (Of course I’m talking printed pictures now – digital is a WHOLE other story…). I have packs of negative sleeves waiting to be used but I always get tripped up trying to figure out how to keep some reference between the negatives and the pictures they came from since the container to hold each would have to be different. Do you know what your plans are to be able to find or cross reference the negative to a picture once the negatives are separated from the prints and put into sleeves? I cannot believe that I have found you! I need this so much. This summer we started to sort our digital pictures and I stooped in the moment when it was overwhelming, because I had same copes on 5 different places. I just did not have motivation to go trough all of that. And the biggest reason why I would like to do that is – my daughter is 5.5 and we do not have her album, we only have some 5 printed photos. It is sad isn’t it. And our second child is on the way. So thank you for motivating me to do this! I have been married over 25 years, have three grown children, and have never once gotten my pictures under control. Thank you, thank you, thank you for helping all of us gain the motivation to finally get this very difficult job done. I knew I couldn’t be the only one with photo chaos, but it makes it so much easier to deal with when you know that you have the entire interwebz behind you cheering you on! I am spending one hour each day sorting my picture packs into vaguely chronological order. Can I friend kiss you? Seriously I have been thinking about this for YEARS! I have so many photos that I really need to get a handle on all them. I can’t wait to follow this series. Hi There! Found your posts through pinterest and I am so excited to organize my photos! Its very long over due!!!! I just wanted to suggest, if you didn’t already … I am a photographer as well and for my client’s photos, I use a program called Photo Mechanic to cull/organize my photos. It was only like $200 and you can have on multiple computers so I think even if someone isn’t a photographer, it would beneficial to purchase and maybe split with a family member or friend and use that program to help cull and organize digital photos. Just a suggestion 😉 Thanks for your awesome posts!!! I’m hoping to have all my stuff organized before baby #2 comes in June! We shall see! Fingers crossed! Thanks so much for this series. I’ve just stumbled on it as I was attempting to do it and didn’t really know where to start. I love this and is part of what needs to be done… but still need to figure out what to do with my heritage photos, some are well over 100 year old. I took 18 boxes of photos, slides and a few other things from my parents’ house when we closed it up… and our house hasn’t been the same since. They are all sorted by general era. Sorting them by size was a big help since the sizes stay the same for a while. I need an extra room just to use for orgainizing! I’ve started this challenge one year late. I absolutely love part one and it has encouraged me to make progress. Do you have a link to the whole series. I saw you posted a link in March 2015, but it looked like only part one and part two. Are there more??? I hope you have written more. I love the manageable tasks you break this enormous project into. Thank you. Thank you. Hello! I discovered your getting started one year organized photos part 1 and 2. Will you be continuing with this? Hi Rebecca. 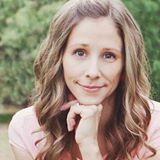 I just found your blog today, and as a mother of two boys I am SO EXCITED to have stumbled upon it. I’m sorry if this has been answered before, but I couldn’t seem to find it – Where do you print your pictures? Do you just have a photo printer or do you use a service? I’ve tried printing mine from Target, but I’ve never been pleased with the quality. This is part 1. How do I get to the other 11 parts? Thanks so much for putting this together and sharing! Your ideas are very helpful because, like you, I have photos everywhere! I just started getting all the printed ones together & organizing them in boxes. One day I will be writing a book of my family history so I will be getting together old photos to put in it. Now I’m working on a scrapbook for my oldest son that just turned 40 which will include photos including some of his ancestors. What do I do with two albums spanning time from begin of 1900 till about 1950s with all photos glued in? It’s 2018 now just found your notes on Pinterest.